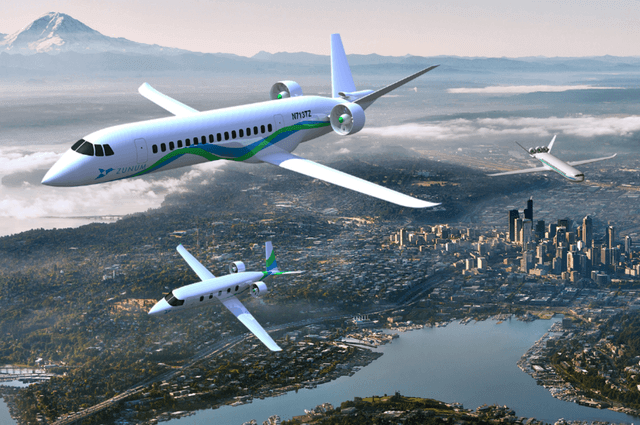 Zunum aero, a startup in Kirkland, Washington, aims to fill the skies with small, quiet electric and hybrid airliners. These range from a ten-passenger mini-liner to a 50-passenger craft similar to regional jets and feeder airliners. Zunum is a Mayan word for hummingbird, and like those little speedsters, Zunum aircraft would make short hops efficiently and quietly – with just the hint of a buzz. Avoiding a back-of-the -hand pat-down in front of strangers is almost enough to seal the deal for most of us. The whole idea is similar to what William T. Piper envisioned with his Cubs transiting short distances between rural towns and landing in community airports or farmer’s fields. This was aviation at a most democratic level, open to all those who wanted to participate. As Zunum points out, “Our stock of 13,500 airports is the largest in the world, yet just 140 of the largest hubs carry over 97% of air traffic. This has left many of us with long drives to catch a flight, while on shorter trips we skip air travel altogether. 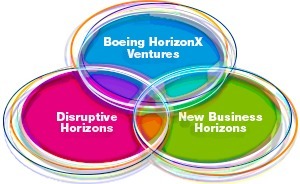 Communities without good air service also struggle to attract investment and create jobs.” Boeing, through its Horizon X program, backs this disruptive business model and the technology involved. Jet Blue’s Technology Ventures wants to explore the lucrative, and mostly neglected markets such airplanes can open. Although the Internet promises commuter-less living, most of us still grudgingly embrace daily gridlock to reach an office with other wage slaves. Our meetings with distant members of our corporate tribe or clients involve the inconvenience of suffering more gridlock only to remove our shoes and pass a series of unspoken tests. Then we are allowed onto a big metal tube hosted by sometimes churlish “attendants,” who’ve gone through much the same ordeal to be there to serve us. 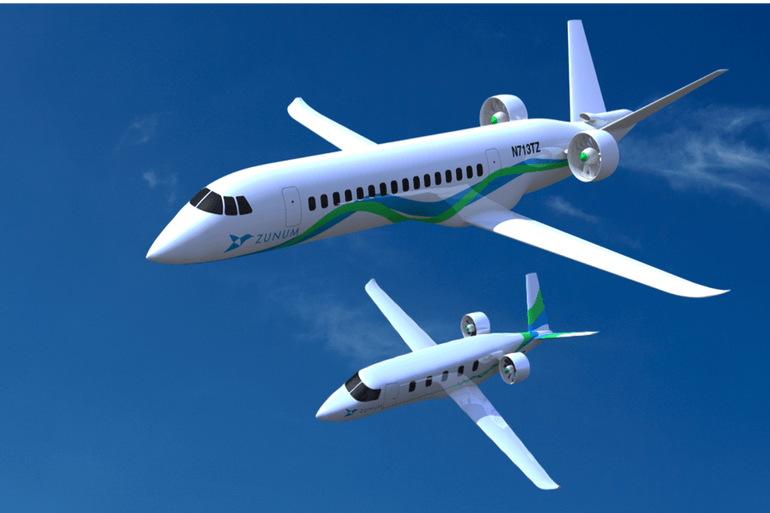 A small airplane with a single-aisle separating only window seats would be a great improvement, propelled by a quiet battery or hybrid power system. Trips between regional hub airports or to destination attractions would actually be faster than the big bird alternative, and a great deal less frustrating. Since Zunum’s aircraft will fly slower and at lower altitudes than the big birds, passengers could enjoy the view and spot landmarks, or enjoy their wireless connections to the bigger world. Zunum promises stewardship for the land passing beneath their wings, with their small craft, “that sip fuel only when they have to.” As batteries continually improve, fuel will be less a necessity. Electric flight would be less expensive and not subject to the market fluctuations to which aviation fuels are prey. The aircrafts’ wings seen in their illustrations have straight trailing edges and slightly swept leading edges, a combination seen on DC-3s and T-6 Texans. These craft fly in the lower end of what passengers might expect from Zunum’s petite airliners. Your editor has flown on both a Ford Tri-Motor and a Dehavilland Dragon, a twin-engine biplane. They are wonderful, but not thoroughly practical experiences. A modern equivalent capable of providing a great view, faster-than-driving journeys, and the convenience of landing in or near one’s destination will reduce the stress of modern air travel while increasing its enjoyment. Zunum’s four founding principals are highly educated and devoted to the concept. With Wright Aero, Empirical Systems Aerospace, Inc. (ESAero) and Aurora Flight Sciences working on similar concepts, a growing number of entrepreneurs see the marketplace as open for business. Their success will only make flying a nicer experience.